Not as numerous as Underground Resistance’s super group Galaxy 2 Galaxy, Timeline follows the concept of the UR the Band. 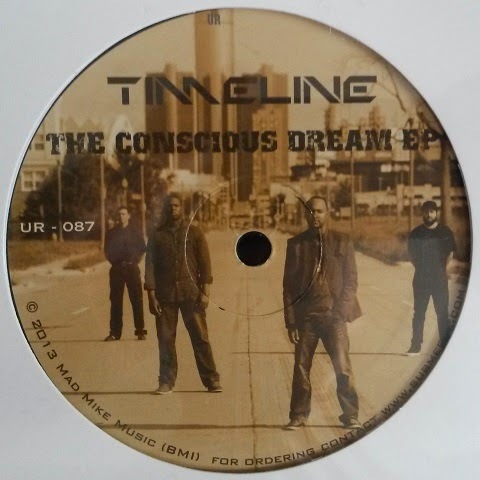 A project conceived and run by Mike Banks, and uniting artists like keyboardist Jon Dixon, sax player DeSean Jones and producer/DJ Mark Flash, Timeline is a travelling live collective standing for Detroit’s spiritual side. Whereas the perspective arising from house and jazz is not new for the headquarters of techno, when thinking of early UR productions or labels like Happy Records. As expected, “The Conscious Dream EP” reveals the smoother side of UR’s storm bringers, true to the proclamation this is not techno, this is high-tech jazz. The flair of cafe bands from the decades ago is felt in the deep house track “Light My Fire”, a stroll in the Sax Boulevard to the junction of Piano Avenue, accompanied by female vocals over the jazz dribble. In the similar laid-back vein, “Moment In Marseille” relies on sax and vocals and the bass acquires a more central role than in the previous cut. The closest to UR’s signature sound is the B-side’s “Next Step 4wrd” with cozy horns and gracious synths in the turquoise light of futurism, matching the sleekness of preceding tracks. The Timeline EP is one of UR’s three recent releases, along with Nomadico’s “Yaxteq” and Alone’s “Has God Left This City?”, meaning that 2014 will be a good year for the Detroit crew.